Unless you have been living under a rock lately you have probably heard the big news about the upcoming addition to the Age of Sigmar. Coming out this summer is a book containing three new ways to play, one of which contains the points value that a lot of people have been asking for is on its way. Today I have a few of my quick thoughts on it. First off, the way this was announced was huge. GW brought in Ben, Dan, Wayne, and Russ from the Bad Dice, Heelanhammer, and Facehammer Podcasts to help them play test the new matched play. Not only that, but they allowed a lot of the first major announcements about the details of the book to come out through their podcasts. This is pretty big and a huge indication of GW's new openness to interacting with the community. Without further ado here are my thoughts on what's been announced so far. I'm really excited for this. It looks to be a version of the game that strongly encourages linked battles and customization. Do you like telling a story with your games of AoS? Then I think this will be what scratches that itch. With 66 Battleplans planned to be in this book and only six of them being for Matched Play I have a strong feeling that the vast majority of them will be for Narrative Play. I can definitely see myself utilizing this version a lot and I am already thinking of all of the cool stuff I can do with this regarding the Endless Deserts. This is also supposed to contain the rules for Path to Glory which lets you build up a small war band into a larger army, perfect for new players. I really hope there is a strong mechanic for customizing your heroes as the games progresses, with added war gear and abilities, kind of similar to what they have in the various Time of War rules but maybe something a bit more advanced and structured. They have already shown some linked games in the Stormcast Extremis book and I expect to see some mechanics similar to this as well. Honestly the possibilities that this opens up seems great and is what I have always wanted supported from GW for any of their games. It kind of sounds like a creator tool set to allow the fans to make what they want, but have a little bit of guidance on it. This is the one everyone is talking about. 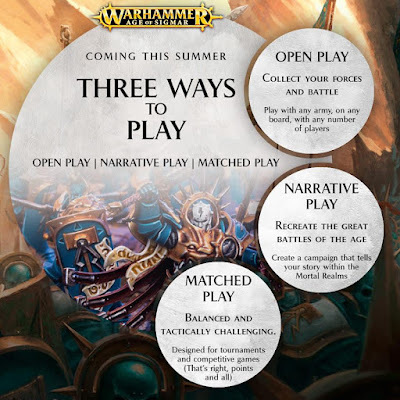 Matched Play introduces points for every Warscroll (yes, including "legacy" scrolls) and a set of scenarios more suited towards tournament play. It will be great for tournaments and hopefully create a unified system across all of the different ones. I'm sure TOs will still make slight tweaks to some rules questions, but that's to be expected. While I am excited to see how the points system works and how balanced it feels, I am most interested to see what other changes to the rules they have made for tournament play. For instance, will measuring from the base now be in the rules, what changes have they made to balance out summoning a bit more, and I'm sure there are more that I can't even think of right now. This will also be great for pickup games, allowing two strangers to quickly throw down on the table. If nothing else the points system can be used, ignoring the rest of the changes if they wish. In fact I see this points system getting used a lot, even in non Matched Play games. It will be a quick way to organize Narrative games as well. I do hope that it doesn't completely overshadow the non-pointed way to play though. I liked the idea of bringing a small force of what I want and playing a game without having to worry about "balance". Also, this could lead to games "feeling too small" once you realize you are only playing with say, 500 points. From what I have heard though it sounds like they have created a way for this to scale nicely from small games to larger ones. There is also supposedly a type of force organization chart similar to the one from 40k to help you structure your force. This also sounds pretty cool, but I hope it allows for more heroes then 40k does since multiple heroes seems to be the bread and butter of AoS. I'm sure they have thought of all of this already though. I think Matched Play will do a lot to bring back a bunch of the people who left Warhammer after the switch to AoS. I know one person personally who had abandoned it and now says he may give it a try again with points. Growing the community can only be a good thing. We just need to make sure that AoS maintains the wonderfully creative and free feeling that it already has once we get these new structures in place. Honestly, I don't think it will be a huge problem. The people who want to always play Matched Play will do so, and those who want Open Play will continue on as they have been doing. I think Narrative Play will be the initial meeting ground for these two sets of players, offering them both something new. All in all I am really excited for the release of the General's Handbook. Points will help standardize everything across the globe, and Narrative Play looks to offer a ton to the community. I think this can only be a good thing. Also, I do not think this is GW reacting to "poor sales" like a lot of the AoS detractors like to say. I can't help but think this has been in the works for awhile now, and by holding off on releasing this from the get go, GW has done a terrific job of crafting the AoS community into a much freer and creative place, putting the emphasis on the player to create. This has led to some of the coolest things by fans I have ever seen in any GW system. Now that the community is in place they have come out with the other side of the coin, bringing the tournament play back in while offering new content to everyone. It also looks like it will be fairly cheap, at around $30. I do hope the points are included in the App though with a nifty army building feature. I know that will eat up a lot of my time and also allow them to make adjustments and add in points for new releases while keeping it free for everyone. For my updates on this be sure to follow the Bad Dice Podcast, Heelanhammer, and Facehammer, since they are the ones GW brought in to help them with this and are also the only people who have actually seen the whole book outside of GW. I expect we will find out even more about this as the release date approaches. One last thing, I must say this is rather cool that GW has revealed this so far ahead of release and I think it shows a new marketing strategy from GW coupled with their new social media accounts. I almost feel like we are entering into a new "Golden Age" of Games Workshop here and I am really excited to see what the future holds.